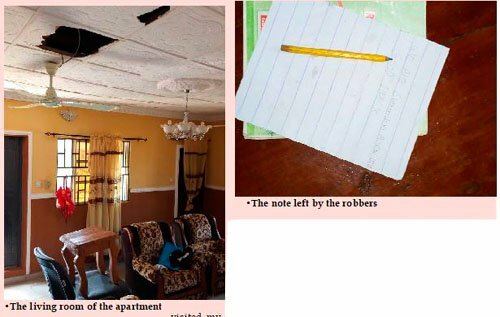 Robbers Break Into House & Met Victims’ Absence, They Left A Note: ’We’re coming back o!!!" Frustrated by the absence of their victims from home, suspected robbers penultimate Saturday left a note threatening to return to complete their mission to the house. He said: "The suspected robbers visited my residence while I was away from home with my wife and children. They ransacked the house and scattered everywhere. "I noticed that they fruitlessly tried to force their way into my apartment through the main door to the building. They however broke the ceiling of the next flat and entered my apartment through the roof, while they carted away a satellite television decoder in the living room.